Let’s get into this right away! While traveling to India, you will want to stay in touch with your family and friends back home. You might also want to contact fellow travelers whom you met along the way or reach out to any local services. Using the international roaming services of your mobile provider can prove to be quite expensive as International data roaming charges or global roaming charges are incurred because your network operator has a tie up with other network operators that give you services on their behalf and hence the cost extra. Trabug is a great solution for foreigners, especially for people from USA, UK who are travelling to India and have high internet roaming charges because of using phone overseas while travelling. For the people in USA, we elaborate more on this in our article ‘How to avoid International Data Roaming Charges outside of the USA? And know more about it here: Trabug helps you save more than 70% on international roaming. While you are travelling to India, there is a high possibility that your mobile will not work in India due to the bandwidth compatibility issue. To stay connected, you may have to buy a new, compatible mobile phone or even pay mobile charges abroad. Trabug plugs this gap by renting a compatible smartphone to you, the cost of which is bundled with your service plan. No separate or hidden costs in using mobile overseas. We have replaced the native smartphone interface with our super-easy interface for your convenience. This is a small convenient portable wifi modem in a pocket sized device that you can rent on per day basis for overseas data. The device gives you access to high speed internet (4G) and lets you connect upto 10 devices at cheap data roaming prices. It is handy and lasts upto 6 hours after 1 full charge while roaming abroad. It can be charged again using a regular USB android cord. This pocket wifi router comes with a companion app. This option is indeed the ‘best sim in India’ option as it comes for a lot less than the actual 4G sim card price in the Indian shops. In India, to purchase a travel SIM card India sometimes takes up to days altogether and the formalities are as long as 7 steps. Whereas, every Trabug Pack contains a 4G SIM card mobile in India. The 4G connection of this indian sim will help you in speedy downloads, easy internet access, instant messaging, video calling, and much more all at cheapest roaming charges. You can benefit from our best-researched plans across multiple service providers to provide you with great options while you travel. There’s a good variety to choose from but not too much to confuse you either. You can even top-up on the go right from the smartphone! Check out Trabug’s plans for the cheapest international data plan & the cheapest international roaming charges. While booking Trabug, you have to submit documents for compliance and security purposes and the Trabug Pack will be delivered to you upon your arrival in India. There is a one-time document submission process through our website unlike a seven step process that you go through to buy 4g sim cards in India. The list of required documents is available at Trabug.com. The Trabug Pack shall be delivered on the day of your arrival at your designated address, whether that’s a hotel, an office, or a residence. Guaranteed. It can be ordered in Delhi and left for return at Mumbai. The Trabug team is pretty cool like that! Just make sure to book your phone at least 5 days before arrival. Getting the Trabug Pack back from you is our job. You don’t need to plan it. We provide complete door-to-door service. The phone is picked up from whatever place you leave it at. And it’s done! No hassles, no troubles. With Trabug you can get to know your environment well. You are never lost with Trabug! The phone comes with reliable information about places to visit, eat, stay at, it seems like you have someone to guide you through the new places. And it’s even more awesome when you get to book a cab with a preinstalled Uber/Ola app to reach these places. We wish all our travellers a safe trip. In case of an emergency, you can easily reach out to the nearest police station, hospital or embassy any time with the details accessible from the Trabug device. Trabug comes with 4G data which is way better than any other data provided by international data roaming sim. You can convert your Trabug mobile phone into a WiFi Hotspot and share its Internet connection with your other devices. 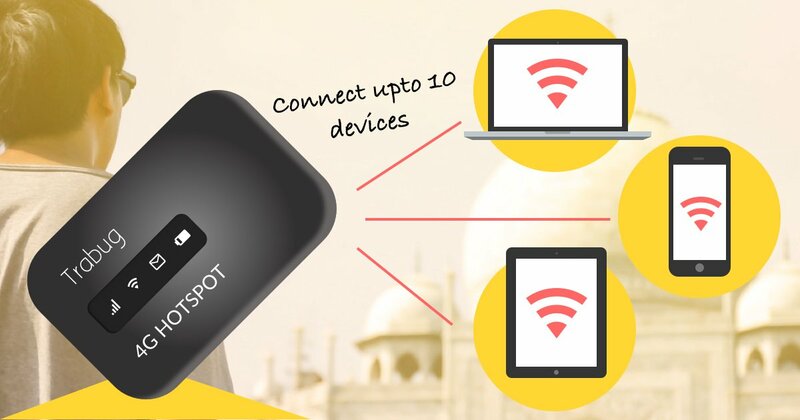 Or just get “The Pocket Wifi Device” which is a portable wifi device and connect upto 10 devices with no extra roaming fees. Trabug comes with pre-installed apps like Instagram, Facebook, Youtube, and Skype. There’s no need to spend time, effort and data installing apps. One can even use personal services on the phone without getting concerned as you get to checkout and wipe off all the personal data once you are ready to return it. So check your private mails, click silly selfies, scroll through Facebook all without any worry! A lot of planning is required when roaming around in a new place. With Trabug, you don’t have to spend all your time planning. Let your Trabug device worry about that! You don’t have to go out scouting for currency changers or the best rates. With just a few taps on the Trabug phone, you can have Indian rupees delivered straight to you! Trabug phones come with a generous amount of calling minutes pre-loaded all in the package of a 4G sim card price. But in case you require more minutes or data, a top-up facility is available on the phone itself. We are just a phone call away, in case you need to reach out to us for any support or help. You can always talk to us in case you are stuck somewhere or need some advice. Trabug acts as a personal tour guide while supporting you with audio tours of various places of interest. This in turn, reduces the dependency on local tour guides and local internet. Enjoy the sights while you fill your ears with relevant sounds! While traveling to a foreign nation, it’s always good to know where your embassy is. Trabug provides easy access to that with Embassy Name, Address and Contact details. Getting a cab with Trabug requires nothing more than a simple tap. Uber is our preferred travel partner. You can log in to your existing Uber account or open a new one to access the service.